Promoter extraordinaire, Sammy Gello-ani called me about noon today to touch base and inform me that the ALA Team and Z Gorres are boarding the Philippine Air Lines flight tonight, May 29th at 10 PM on the way to Manila and Cebu. The plane expects to touch down at NAIA on Wednesday, May 31, Manila time. 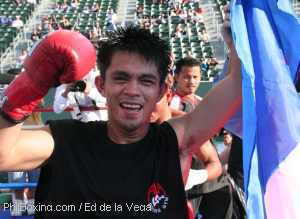 Gorres is fresh from a clean unanimous decision victory over Pedro Rincon Miranda of Columbia. 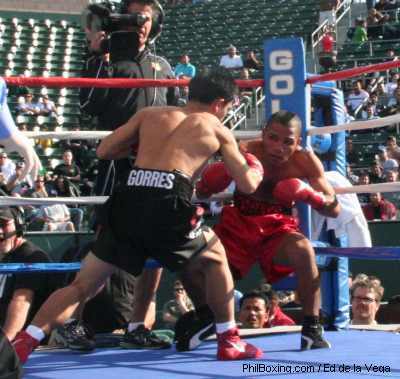 The sweet punching Gorres proved certain non-believers that he too packs a mean wallop by knocking down Rincon three times during the 10 round bout held last Saturday at the Home Depot Center. He is coming home for a well deserved rest after being away for over a month to fulfill his contract to fight in the US under the Golden Boy Promotions of Oscar de la Hoya. Z Gorres (left) corners his opponent, Pedro Rincon Miranda of Columbia, in route to a shutout unanimous decision victory during last Saturday's fight at the Home Deport Center in the city of Carson, LA County, California. On the plane together with Gorres will be promoter Sam Gello-ani and the ALA Team Chief Trainer, Edito ALA Villamor. During a candid conversation while watching the Montiel-Gonzales fight last Saturday, Villamor hinted to me that he too is just as homesick as Gorres and can't wait to go home and be with his family. Villamor is also looking forward to share a beer or two with his friends home and from PACLAND, talk about the many wonderful stories of their stay in the US with Denoy, Amonzot, Bautista and Gorres. "I can't wait to share the many pictures you gave us, Doc Ed", he said. As for Gorres, when I asked him what his short term plans are while at home after a long absence, he simply replied: "I would just like to savor the victory with my family who truly are the beneficiary of the work I do here in the US. My hard work and sacrifices are for them". "I would also like to share this victory with my benefactors, the people at ALA Gym and the Filipino people who supported me".